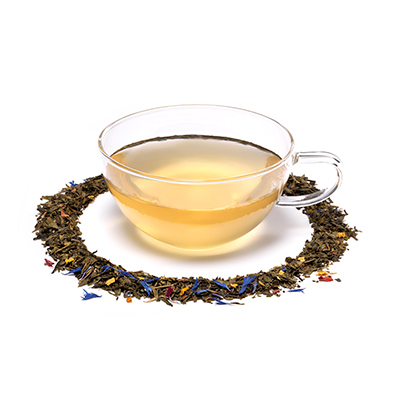 Looking for Mango and Bergamot Loose Tea? This sweet yet sophisticated green tea is perfect for adding a twist of summer exoticism to an afternoon spread, delicately blended with flavours of mango and bergamot. A Great Taste Award winner in both 2013 and 2014, the judges admired the tea's 'good sweetness on the finish', describing it as 'clean and sweet throughout'. High quality green Sencha tea leaves form the base of the blend, picked in early spring and steamed and rolled to maintain their verdant colour and herby taste. Green Tea, Mango Flavouring, Lulo Flavouring, 1.5% Petals (Cornflower, Sunflower & Rose), Bergamot Flavouring. We’ve chosen the number 7 for our Mango & Bergamot, the number of different ingredients in this harmonious blend.